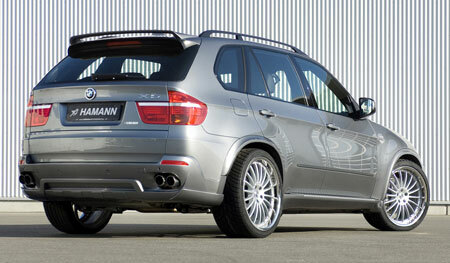 Hamann has put their tuning touch on the recently launched E70 BMW X5, and all three variants have had their powers upped, with the 3.0d turbodiesel getting the most gains. The E70 BMW X5 3.0si gets it’s power bumped up from 272 horsepower to 286 horsepower, while torque is boosted from 315Nm to 340Nm. That would be 14 horses and 25Nm respectively. The top of the range 4.8i model now makes 18 more horses at 373 horsepower compared to the stock 355 horsepower. The turbodiesel 3.0d has the most gains, going from 235 horsepower up to 265 horsepower in Hamann-tuned form, with torque going up from 520Nm to a significantly higher 600Nm! The bodykit includes a new front and rear apron and a roof spoiler. There are 4 different wheel designs to go with the new Hamannised E70, called PG3, Anniversary I, Anniversary II and Edition Race. PG3 and Anniversary I are available in both 20 inch and 22 inch sizes, the Anniversary II in 22 inch size only, while the colossal Edition Race is a large 23 inches in size. Hamann also enhances handling via new suspension springs which lower the car between 30mm to 40mm depending on whether the X5 is equipped with level regulation or not. On the interior, it is mostly aesthetics to remind you that you are driving a Hamann-tuned X5 – black foot mat flooring, aluminium pedal and footrest, the option for more upmarket leather, and multimedia entertainment options such as an integrated Playstation 2.